The French illustrator, painter, and theatrical designer Georges Barbier (1882-1932) was born in the seaport city of Nantes. The city's seventeenth-and eighteenth-century architecture, as well as its art museum collections, with works by Antoine Watteau and Jean-Auguste-Dominique Ingres, influenced Barbier's aesthetic sensibilities. As a young man he moved to Paris where, between 1908 and 1910, he studied at l'École des beaux-arts in the atelier of the academic history painter, Jean-Paul Laurens. Although Barbier's artistic style differed significantly from that of his teacher, his appreciation of the past as a source of inspiration was undoubtedly reinforced by Laurens's subjects. In the galleries of the Louvre, Barbier discovered the art of classical antiquity. His enduring admiration for Greek and Etruscan vases, Tanagra figurines, and small Egyptian sculptures is evident in his depiction of the human body and resonates overall in the clarity and restraint of his graphic work. His refined color sense and use of strong colors, influenced by costumes of the Ballets Russes, which was founded in Paris in 1909, also characterize his work. 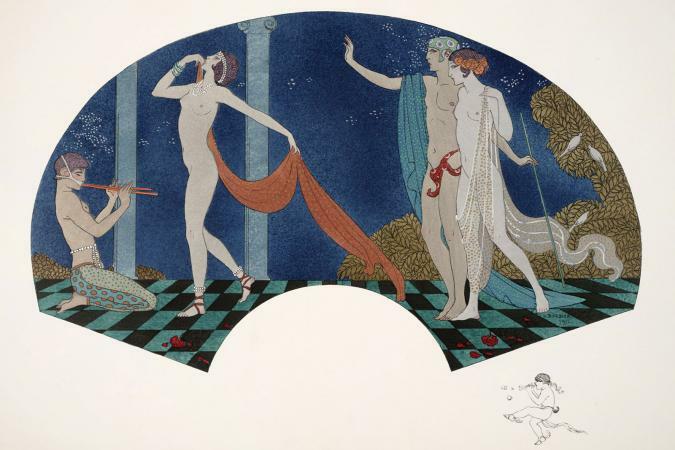 Barbier first exhibited at the Salon des humoristes in 1911, where his drawings were immediately acclaimed; subsequently, he was a regular contributor to the Salon des artistes décorateurs. Barbier was a prolific and skillful artist whose sophisticated style was in great demand. Over the course of his brief career, he contributed to most of the leading French fashion journals and almanacs; illustrated numerous publications of classic and contemporary French prose and poetry issued in limited, deluxe editions; and designed costumes for stage productions, including ballet, film, and revues, such as the Folies Bergère and the Casino de Paris. In addition, Barbier wrote essays on fashion that appeared in La Gazette du bon ton and other journals, and as a member of the Société des artistes décorateurs, he produced designs for jewelry, glass, and wallpaper. One of the most well-known and highly regarded artists working in the second and third decades of the twentieth century, Barbier died in Paris at the peak of his profession in 1932. In Michael Arlen's best-selling 1924 novel, The Green Hat, the heroine Iris March is compared to a figure in a Barbier fashion illustration: "She stood carelessly like the women in Georges Barbier's almanacs, Falbalas et Fanfreluches, who know how to stand carelessly. Her hands were thrust into the pockets of a light brown leather jacket-pour le sport" (Steele, p. 247). The casual elegance ascribed to Arlen's character, a quintessential element of the 1920s fashion ideal, epitomizes Barbier's figures. With their strong yet lithe forms and dark-lidded, slightly exotic eyes, Barbier's women embody the notions of female beauty and grace of the time. Beginning with the innovative and influential Le Journal des dames et des modes (1912-1914), launched by Lucien Vogel, Barbier's talents were sought after by the publishers and editors of avant-garde fashion magazines. Following the lead of the couturier Paul Poiret, whose collaboration with the artists Paul Iribe and Georges Lepape in 1908 and 1911, respectively, set the standard for a new, modernist presentation of fashion, these publications showcased the emerging art deco aesthetic. Rather than realistic, fussily detailed renderings of dress, Barbier and his fellow illustrators (Lepape, Iribe, Bernard Boutet de Monvel, Pierre Brissaud, and Charles Martin, among others) created bold, stylized images that conveyed mood and atmosphere. The laborious technique of pochoir printing used for these illustrations (a hand-stenciled process whereby layers of color are built up in gouache paint) enhanced their visual impact. In addition to Le Journal des dames, Barbier contributed widely to other luxury fashion periodicals including La Gazette du bon ton (1912-1925), Les Feuillets d'art (1919-1922), and Art goût beauté (1920-1933), as well as Vogue, Femina, and La Vie parisienne. Barbier was also commissioned to illustrate more specialized fashion publications: couturiers' albums and almanacs, such as Modes et manières d'aujourd'hui (1912-1923), La Guirlande des mois (1917-1920), Le Bonheur du jour (1920-1924), and Falbalas et fanfreluches (1922-1926). Modeled after the early nineteenth-century publication Le Bon genre that chronicles the modes and lifestyle of the First Empire and the Bourbon restoration, Barbier's refined and often witty drawings for particular almanacs not only depict Parisian haute couture but also record the social scene and fashionable activities in charming vignettes. Although it is primarily through Barbier's fashion illustrations that one is familiar with his work, in his lifetime his book illustrations and theatrical costume designs contributed significantly to his artistic reputation and success. 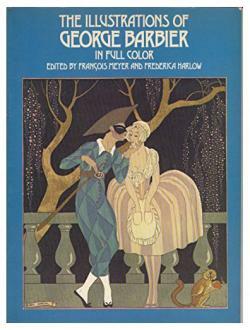 Both authors with whom he collaborated and critics agreed that Barbier was able to distill the essence of a literary text and give it visual form. His interpretations of historic dress and interiors for the stage (including Casanova and La Dernière nuit de Don Juan by Edmond Rostand, Marion Delorme by Victor Hugo, and Lysistrata by Maurice Donnay) were admired for their imaginative evocation of a particular time and place, rather than representing merely a scrupulous imitation or pastiche. Barbier's love of the exotic resulted in spectacular beribboned, furred, feathered, and jeweled fantasy costumes for revue performers at popular Paris nightclubs. In the preface to Personnages de comédie (1922), illustrated by Barbier, Albert Flament refers to him as "One of the most precious and significant artists of our era…. When our times are lost … in the dust … some of his water-colours and drawings will be all that is necessary to resurrect the taste and the spirit of the years in which we have lived" (Ginsburg, p. 3). Barbier was undoubtedly one of the preeminent fashion illustrators of the early twentieth century. Among the group of artists including Lepape, Iribe, and Monvel, dubbed "The Knights of the Bracelet" by Vogue in 1922 (a reference to their "dandyism … and love of luxury" [Barbier, p. 6]), Barbier was in the forefront of the alliance between art and fashion. His superb draftsmanship, color sense, and ability to infuse freshness into historic influences combine to produce distinctive images that define the modernity of the art deco style. See also Art Nouveau and Art Deco; Fashion Illustrators; Fashion Magazines. Georges Barbier. Art Deco Costumes. New York: Crescent Books, 1988. Mackrell, Alice. An Illustrated History of Fashion: 500 Years of Fashion Illustration. New York: Costume and Fashion Press, 1997. Vaudoyer, Jean-Louis, and Henri de Régnier. George Barbier: Étude Critique. Paris: Henry Babou, 1929. Weill, Alain. Parisian Fashion: La Gazette du bon ton, 1912-1925. Paris: Bibliothèque de l'Image, 2000.